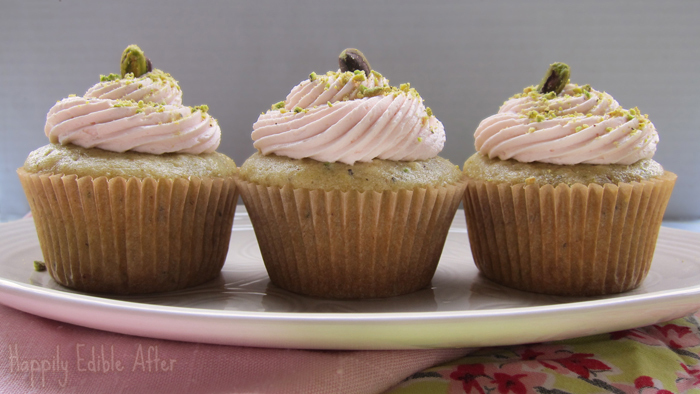 Pistachio & Rose Cupcakes. Amazing bites of heavenly goodness. This flavor combination has long been on my list of favorites and it just totally rocks. Have you cooked with rosewater before? I just adore it. It's been used for centuries to flavor both sweet and savory dishes, especially in Middle Eastern, Indian and Chinese cuisines. I think the first time I tasted it was at a Persian restaurant, in a unique frozen dessert with rice noodles called faludeh. Love at first bite. A while back, I made some eclairs filled with a rosewater pastry cream.....totally swoon-worthy. Mmmm.....baklava, kulfi, rice pudding...would all be delicious with a kiss of the old-fashioned rose. Check out my sunset mango lassi too - yep, there's rosewater in there. So I have to confess. Even though this recipe is originally vegan and very yummy (thank you Isa and Terry - you vegan goddesses!).... I do make it non-vegan sometimes, using real butter in the frosting. Either way, you will love them, especially if you are a culinary adventurer like me. 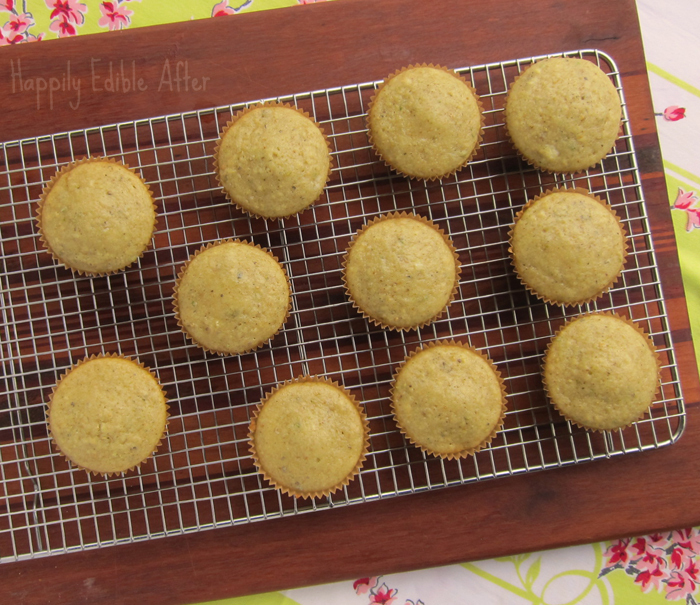 Preheat oven to 350 degrees F. Line a muffin tin with 12 cupcake liners. 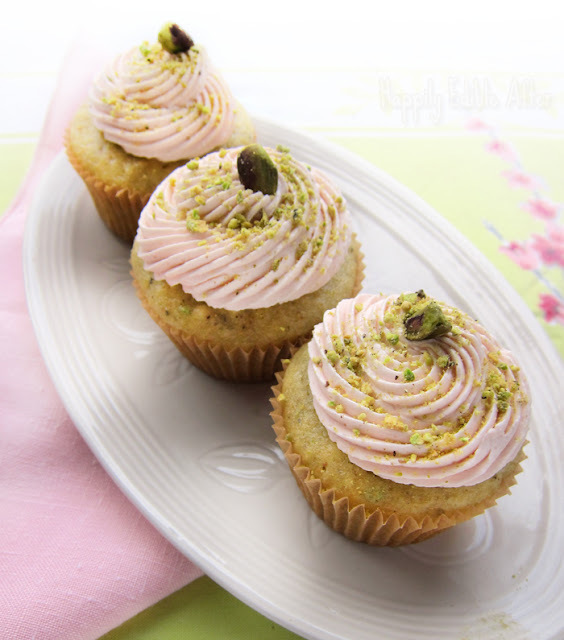 In a large mixing bowl, whisk together yogurt, soy milk, oil, sugar and rosewater. In a medium bowl, sift together the flour, cornstarch, baking soda, baking powder, and salt. 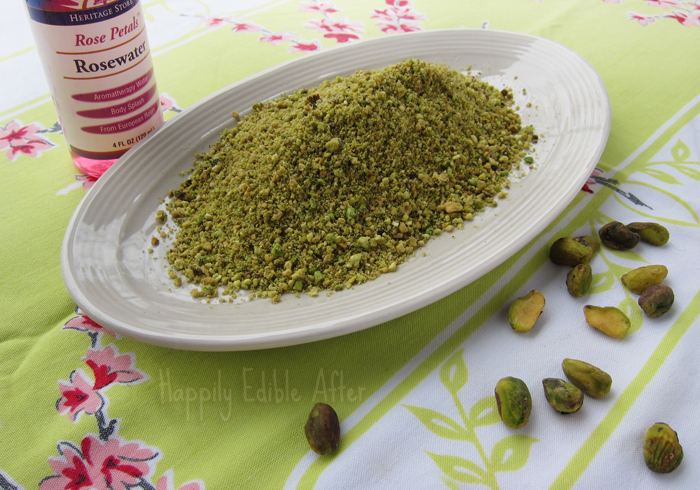 Add pistachios and stir to mix. Add dry ingredients to wet ingredients and mix just until combined. Fill the liners three-quarters of the way. Bake about 18 minutes or until done. Let cool before frosting. Using an electric or standing mixer, beat the butter until light and fluffy. Add the sugar and beat on medium high for a few more minutes, till well blended. Add the vanilla and rose water and beat for another minute. You can also beat in a bit of soy milk to thin if needed. Add a bit of pink food coloring, if you like to tint the frosting. 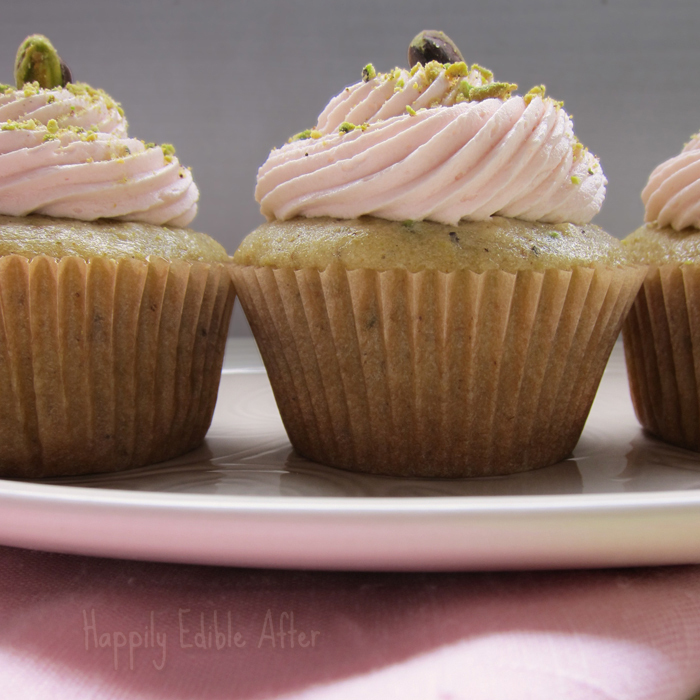 After cupcakes are cooled, frost as desired and garnish with pistachio nuts, or as desired. I am a rosewater fanatic! I will be making these for Easter next weekend! :] Thanks so much for the recipe! I'll definitely let you know how it comes out. Hi Kait, isn't rosewater the best? LOVE it!! Hope everyone at your place enjoys these for Easter. And thank you for your comment....great to hear from you! Hi! These look beautiful and I can't wait to make them! But I have a quick question. I can't use soy (allergy) and was wondering if I need to change the amounts of yogurt and milk if I use regular. Hi Jen, thanks so much for the compliment. These are my fav cupcakes ever. You can certainly opt to substitute regular dairy milk and yogurt and don't need to change the amounts. Hope you enjoy them. These are just what I was looking for. I want to do this for my family today, and I had the exact same questions as Jen. 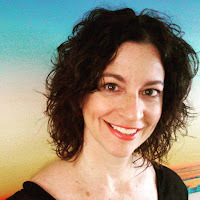 Thank you so much for blogging. Your cupcakes look lovely. I hope your family enjoys them as much as my family and friends do. Thank you for your kind words. Hi can you use coconut oil instead if canola? Hello Rebecca, I don't see any reason why you couldn't use coconut oil to replace canola. Do we get separate rose water for cooking or its the same one which we apply for face? Hello, it is the same as long as there is nothing else added to it...like glycerin, which you might find in a beauty product. I like the Heritage Products brand, but others out there. You can often find it in Middle eastern stores as well.